According to Buffalo Trace, the barrels in this release underwent a variety of special seasoning processes, including utilizing staves that were immersed in an enzyme rich bath with water heated to 100 degrees to make the barrels. After spending time in this proprietary solution, these staves were then placed into kilns and dried until they reached an ideal humidity level for crafting into barrels. Other staves were seasoned outdoors for six months, and still others were left outdoors for a full 12 months before being made into barrels and sent to the Buffalo Trace Distillery to be filled and aged. All barrel staves were seasoned, dried, and crafted at Independent Stave Company, who consulted on this project with the premiere expert on oak maturation, Dr. James Swan. 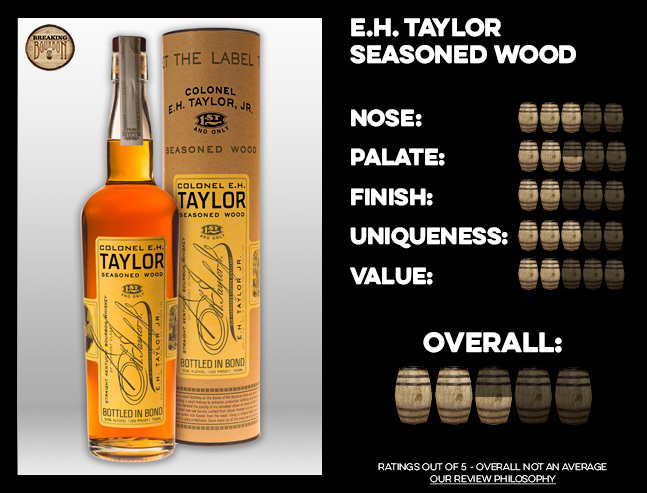 Like E.H. Taylor Cured Oak, E.H. Taylor Seasoned Wood is a planned one-time release. Seasoned Wood is a wheated bourbon. 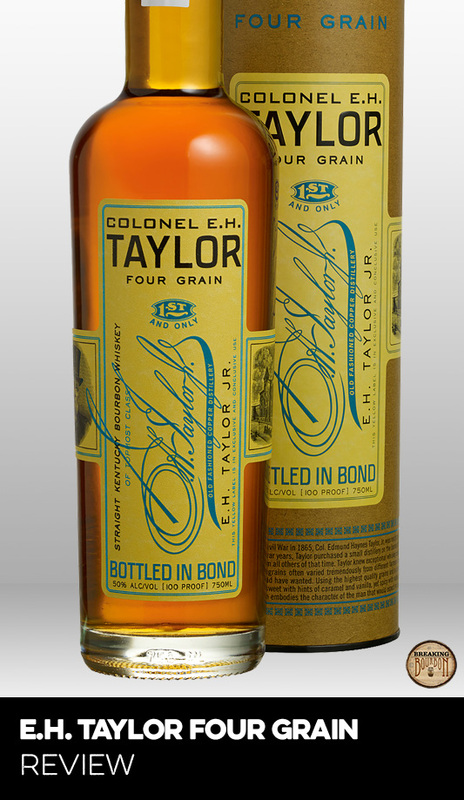 This is the first wheated bourbon Buffalo Trace has released under the E.H. Taylor brand. Buffalo Trace currently makes only one wheated mashbill, but utilizes different warehouses and warehouse floors to create different variations in the flavor profiles. This is a Bottled in Bond (BiB) bourbon. To be labelled BiB, the whiskey must be the product of one distillation season and one distiller at a single distillery, aged in a federally bonded warehouse under U.S. government supervision for at least four years, and it must be bottled at exactly 100 proof. Additionally, the BiB label must clearly identify the distillery where it was distilled and where it was bottled, if different. An immediate greeting of fruit that’s rather light, which is also an ample way of describing the overall intensity of the nose. Notes of dried berries, oak, and peach are present, but have a shyness to them. Vanilla and caramel are the dominant scents and even they aren’t very intense. There is a bit of depth to the nose but it does little to show itself off. You’ll have to actively focus on deconstructing the nose in order to discover them all, as they don’t come willingly. What it maybe lacking in intensity makes up for more than a little of it with it’s overall quality of the scents. A fair amount of oak, butterscotch, and allspice that leans heavily on the nutty side. Oak is ever present throughout, but not to the point of overburdening the palate. The bourbon’s medium weight consistency carries tannins throughout that errs more on the astringent side and less on the bitter side. It’s surface-level complexity does little to keep my interest, as I find little to delight in here. An average palate from a brand known for much more. With barrels responsible for giving bourbon a considerable amount of their flavor characteristics, making changes to this source can have drastic effects. 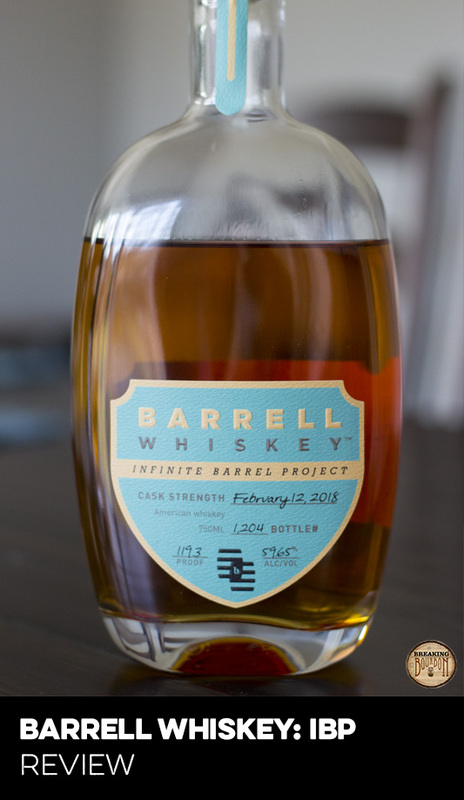 By adjusting the seasoning process for this release (see sidebar), there must have been high hopes at Buffalo Trace that something incredibly unique would come of it. In a way, the reverse seems to have happened. Instead of more intense or layered flavors, the palate tastes like it retracted into itself. The result is a more muted and quite frankly, sheepish palate. The bourbon comes across as having a surface-level complexity with a budget-bourbon tasting experience. Spending time with it reveals some complexities, but far too few to make this anything but an empty experience. I give Buffalo Trace credit for experimenting with a unique process, however the end result is a boring bourbon. There is always some inherent value when a major company tries something different. It’s a captivating window into their thought process. It’s similar to when auto companies build concept cars. You’ll probably never see them in everyday life, but this thinking outside of the box is fascinating for everyone. 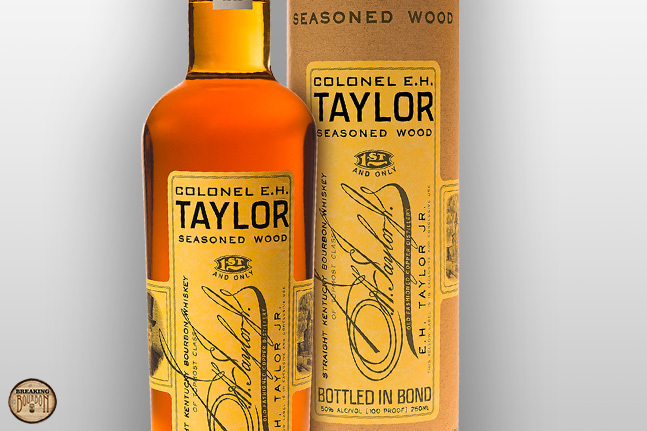 The modern day E.H. Taylor brand has a short list of special releases. Because of this, they often get increased attention. If Seasoned Wood was released as part of Buffalo Trace’s Experimental Collection, expectations and the inevitable buying frenzy would be greatly tempered. Instead, we’ll get a repeat situation of last year’s E.H. Taylor Cured Oak. Impossible to find except for on the secondary market at five times its MSRP. With any special release - or more experiment in this case - deciding if it’s a good value isn’t always obvious. Often times special releases automatically mean higher MSRPs despite what is in the bottle. Buffalo Trace has maintained restraint with the pricing of many of their products including this one. $70 for last year’s Cured Oak was arguably a fair price. Unfortunately with Seasoned Wood and its lackluster delivery, this same asking price isn’t as good this time around. Fascinating experiment or not, what’s in the bottle just isn’t worth its asking price. Aged for well over a decade in barrels that underwent a series of unique treatments, high expectations for Seasoned Wood fall flat as the end result is nothing more than a boring bourbon. Not all special releases can be home runs. Last’s year’s Cured Oak was heavy on the oak for many people, but there were also a lot of other great things going on underneath it. Overall this is an average bourbon that doesn’t contain any real elements to cheer about. I do however applaud the fortitude Buffalo Trace’s Master Distiller Harlen Wheatley took with this. Buffalo Trace has been experimenting with a number of new techniques and their new Warehouse X is to be celebrated. Unfortunately, Seasoned Wood just isn’t the memorable bourbon that I was hoping it would be. Not every release needs to be fireworks in your mouth, but I don’t want a palate that’s afraid of its own shadow either. Buffalo Trace releases so many great products that it makes it all the more disappointing that Seasoned Wood fell flat and couldn’t deliver a better bourbon for its price.